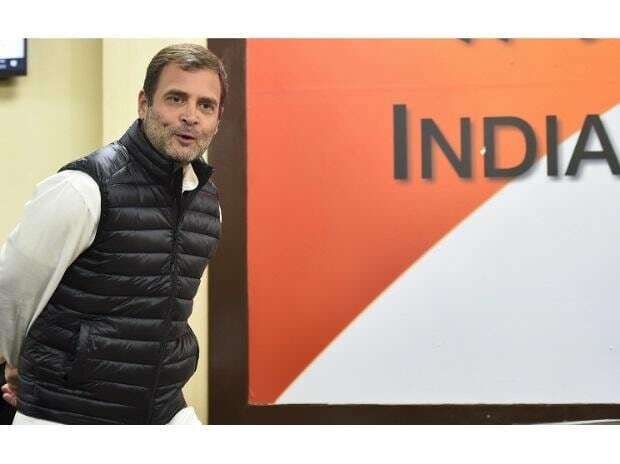 Rahul Gandhi arrived in the Assembly premises around noon, soon after the House was adjourned following Goa Governor Mridula Sinha's address, which was boycotted by Congress members. Congress President Rahul Gandhi on Tuesday met Goa Chief Minister Manohar Parrikar at the state Assembly complex here and enquired about his health. Parrikar, 63, who has been suffering from a pancreatic ailment, heads the BJP-led government in the coastal state. The meeting comes a day after Rahul Gandhi alleged that the "Goa audio tapes", cited by the Congress to attack the Centre on the Rafale issue, were authentic and the state's Chief Minister Parrikar is in possession of "explosive secrets" that give him power over Prime Minister Narendra Modi. After his arrival, the Congress president went to meet the chief minister in his chamber in the Assembly complex. Rahul Gandhi later went to the opposition lobby in the Assembly to meet Congress MLAs.He held a meeting with them for 10 minutes before departing from the venue. The Congress chief refused to talk to waiting mediapersons, saying, "I am getting late." Leader of Opposition Chandrakant Kavlekar, who accompanied Gandhi to meet Parrikar, said, "It was a courtesy visit to enquire about Parrikar's health. There was no discussion other than enquiring about his health condition." Kavlekar said Rahul Gandhi had an informal discussion with Congress MLAs in Goa as he would be arriving here next month to address party workers. Rahul Gandhi and his mother Sonia Gandhi were on a private visit to the coastal state.